Click the button below to add the Level 2 - Roadie Jr Series ATA Case with All Recessed Hardware to your wish list. A step up from our Level 1 Amp Cases, the Level 2 Roadie Jr. Custom Cases with all recessed hardware are constructed with a 1/4" plywood, an attractive yet hard-wearing rubberized plastic laminate and heavy gauge aluminum extrusion rivets. These road cases are finished with excellent quality case hardware, including recessed handles and catches, plus ball corners for further protection. The interior is lined with a solid 1/4" poly foam lining for top-rate gear security. The Roadie Jr. Series also comes with an additional foam sheet for further modification. We offer a variety of styles and upgrades on our custom case options and are looking forward to serving you today! Good cases. My trailer is hard on equipment and these cases do the trick. Custom cases Fast, Reliable, dependable. I won't buy another brand road case. Overall happy with case good amount of foam lining and built it great to the specs I gave . Would like to have seen a little thicker top to the case and a breakaway back would be a great addition so you wouldn't have to remove from case to hook up the snake. But still very happy with it. 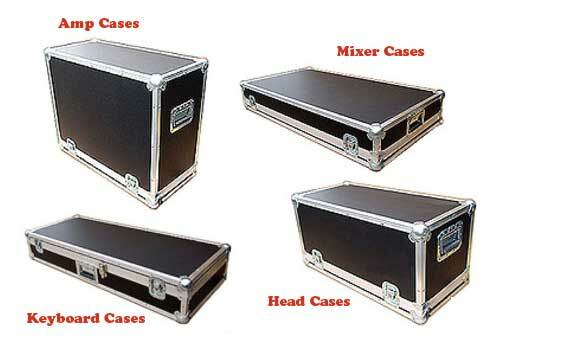 I ordered this custom case with the measurements required and Road Cases USA built and shipped it very fast. It arrived packaged very well and it met all my expectations. The size is perfect as it the quality of construction. Perfect transaction. I would recommend Road Cases USA to all. Wow!! If only all online purchases went this well!! Great website. Very intuitive. Quick response from Roadcasesusa regarding purchase and progress of order. And FREE SHIPPING!! Protect ur gear w cases from these guys and u won't be sorry!! I purchased two cases (one or my amp and one for my keyboard) and as a touring musician, they were put to use immediately. I am very impressed and satisfied with the care and quality that went into the construction of these cases and know that my gear is safe and protected. I will definitely keep coming back to Road Cases USA in the future for more cases! It's great but I'd suggest to upgrade to the Level 3. Very quick service! I purchased the item on a Monday and received it (NJ) on Thursday. Great item for a starter just going out to play but wanting to protect their investment. I bought the level 2 thinking it would be good enough, and it is, but I think it's better to upgrade for the better locking system. The locks tend to get stuck when you're trying to take the top off but other than that it is great. good service and great product! The online ordering experience was painless. Be sure to measure correctly and as they specify on the webpage. The case arrived on the due date and it was in great condition. Really appreciated the extra foam and used most of it. The workmanship is great and the case was build to the exact measurements that I supplied. I gig frequently and am anxious to see how it holds up in a couple of months. Overall, great experience and great product! After placing the order I received proactive communication up-dates regarding the status of my order. Case came with extra foam for me to properly fit mixer. I paid the higher price thinking the foam versus the carpet lined would be better. Unsure now. I provided proper dimensions and was hoping the fit would have been tighter but thankfully for the extra foam. Case is constructed well. I have not used it on the road yet so this in my initial review. Great Product...Strong...Well Made! Fits My Mesa MarkV perfectly.